The man smiled and said, "It's by the hat. It's the hat method." I didn’t know what he was talking about. 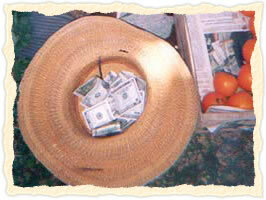 He pointed to a big old farmer's type hat, filled with dollar bills, that sat on the edge of the blanket. “You just put in what feels right to you,” he said. "Give me an idea," I said. "Oh, no," he said, "then it wouldn't be by the hat." He truly offered his vegetables for what people had in their hearts to pay. He was not attached. He really wasn't. He didn't even stay around. And he was so generous with the sweep of his hand that I had such a different feeling. I felt that I had been given a great gift, and, with all my heart, I wanted to pay him enough. It felt like joy to receive, and joy to give. He helped me to feel that these vegetables were the fruits of God and he was simply the deliverer. He was there to be rewarded for his labors. The vegetables weren’t for free. Only he wasn't dictating the price. He truly let go. He wanted his vegetables to go to as many good homes as possible and give all the nourishment they were made for. 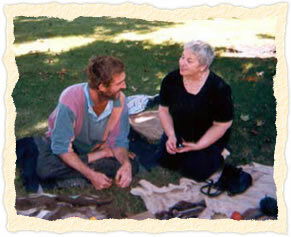 "Martha is the person who told me about Heaven Letters. The important thing is that someone sent me a Heaven Letter as a blessing, and I look forward to Heaven Letters as continued blessings."